My solar panels have had me thinking about reducing my energy usage. I’ve already talked about Why I’m Replacing all of my Lights with LED’s. I also want to be more efficient in the way they are used. I used to manually turn on/off my front outside lights since I leave them running at night. This means lights are on part of the day and off part of the night , I can’t remember or get up early enough to make this efficient. This is where the timers come into play. So on the front of my house, I’ve got two lanterns next to my door. I’ve replaced these lanterns with LED’s I bought from Amazon. Each lantern holds 3 candelabra style bulbs for a total of 6. I also have two more lanterns on either side of my garage. These lanterns only hold one bulb each, a standard size bulb. The bulbs below are the actual bulbs I’m using. You won’t see me advertising any products that I don’t use and would not hesitate to buy again. My lights in front of the garage are on a three-way switch. Basically there are two switches that can turn these lights off and on. That’s all this mean. 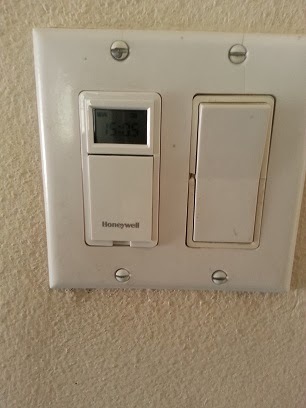 There are different dimmers depending on whether you have a 2-way or 3-way light. So determine what you have by the number of switches you can control the lights with. The standard is the 2-way which I already replaced. The 3-way below is very similar. One cool thing about these timers is that they have a built-in rechargeable battery. This means that if the electricity goes out, you won’t lose your settings. The timer I had previously was terrible. It was an old Intermatic that the previous owners used and had no backup battery and was very hard to set up. It was such a pain every time the electricity went out. This prompted me to look for replacements. 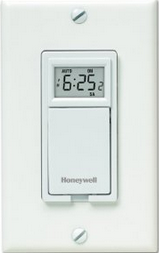 Both are currently $22 on Amazon and according to Honeywell’s website the 530a can be used with either a two-way or 3-way switch. Here’s the manual if you’re interested. 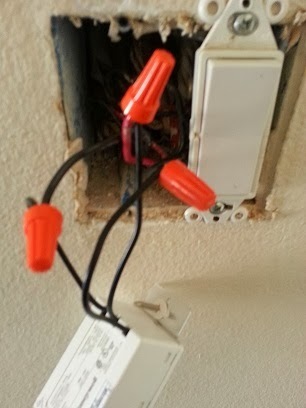 I’m no electrician but below is what worked for me. Use your phillips or slot screwdriver to remove the plate. After removing the plate, this is what it looks like. Step Three – Remove the screw from your old switch. I removed the screws and pulled out the switch (using the needle-nose pliers) so I can get access to the wires. Here’s what the back of the switch looks like in a three-way switch. Notice that there is one red wire and two black wires. 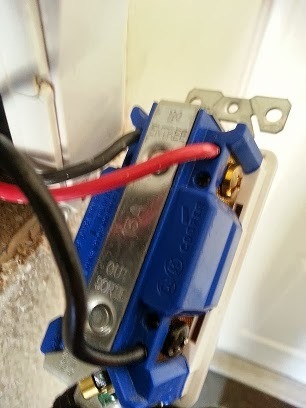 The black wires are hot and carry current. I used a phillips screwdriver to remove all three wires. Below is what the back of the dimmer looks like. Note: The exposed wire on the timer wasn’t very long so I used a wire stripper so I have more room. Here’s a picture after connecting the wires and attaching the caps. Step Seven – Turn on the electricity and make sure the screen comes on. This ensures you have hooked it up properly. 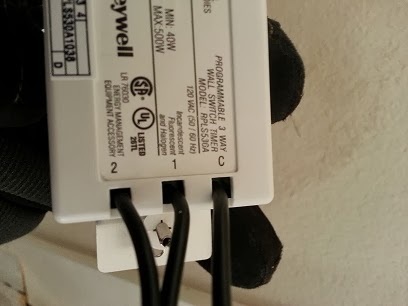 Step Eight – I turned the electricity back off and stuffed the wires back into the wall. Again, I used the needle-nose pliers. 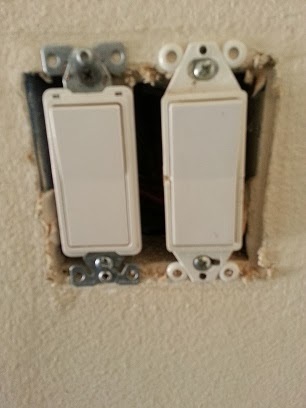 Step Nine – Screw the timer into the holes in the dry wall so it is sitting level with your other switch and the plate will fit. Step Ten – Now put the plate back on and screw into the wall. Programming is simple and instructions are included. You can program each day different or every day the same. 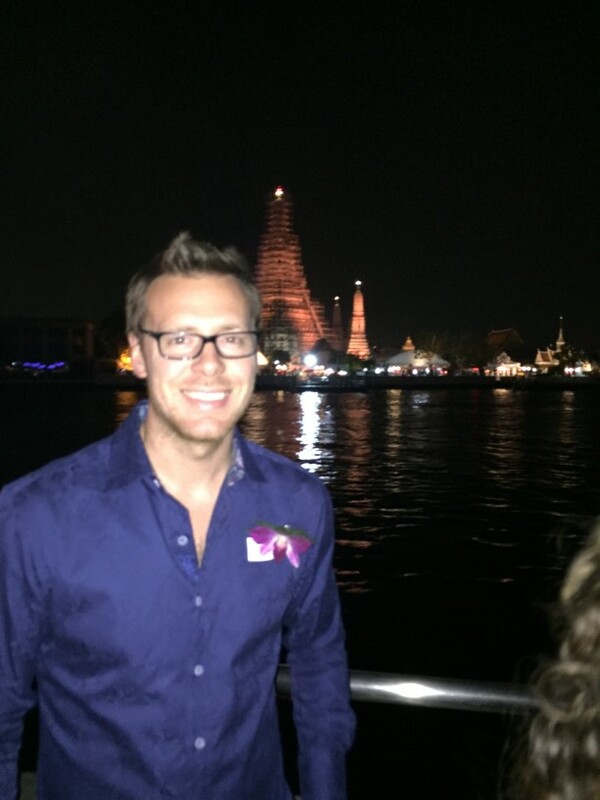 I posted about one of my 2014 goals to reduce my energy usage. What better way to reduce energy production than to become more energy efficient and save money at the same time. I wanted to give an example of a fan I just replaced lights on this weekend and break out the cost savings. If you read my article, “Why I’m Replacing All of My Light Bulbs with LED Bulbs“, you may have noticed all of the ridiculous sizes of these bulbs. Granted, most of my sockets are the standard (E26) and the candelabra (E12). However, I have one fan that has E17 sockets! This is an intermediate size and I couldn’t even find any LED bulbs to match this size. So what I did find was an adapter. Yes, I found an adapter on Amazon that screws onto a candelabra bulb and turns it into a medium socket bulb. What this means is that I can use my candelabra size LED’s in the medium socket. I was skeptical at first and just ordered 1. I installed it and it worked like a charm. This was last week. I ordered 3 more adapters and put them on this week. They work perfectly. Here’s the part from Amazon if you’re interested (they are $3.92 shipped). The LED’s that I’ve ordered and used a few times are from FEIT electric. They fit a candelabra screw base (standard in fans, lanterns, etc.) It’s basically the skinny sockets you see in your house. These are the ones I used with the adapters. They use 4.8 Watts per bulb and put out 300 lumens of light. My wife also liked the shape and color of light better from these bulbs than our old bulbs. If you do decide to buy these bulbs or the adapter please click on the picture to go to Amazon so I can get a very small credit. The link above is the cheapest candelabra LED’s I’ve found so far. They are currently $17.83 + $4.99 shipping. I had to order a few packs to replace different bulbs around the house. Keep in mind, these are the only intermediate sockets I’ve found so far in my house. So this install was a little more expensive than normal. However, it’s still worth it. I’ll show you why. There were 4 bulbs so the total cost to replace the bulbs in this fan were $46.12. 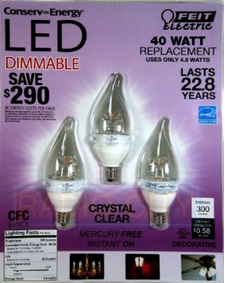 The bulbs that I replaced were also from FEIT but were 40W incandescent bulbs. So when in use, my 4 LED bulbs use 19.2 Watts of electricity. This compares to 160 Watts of electricity! This fan is in my living room so they are probably on for only 1 hour a day. Obviously, the more you use the lights that you are replacing, the faster you get your money back and start saving. At 1 hour per day (365 hours/year), the old lights would use 58,400 Wh or 58.4 KWh. At $0.13/kwh, this is $7.60. The new LED lights use 7KWh or $0.90 worth of electricity. This is a savings of $6.70/year. At this rate, the breakeven on my fan would be 6.9 years. For an investment, this really isn’t that bad. This is also an extreme example where I needed an adapter and also only use the lights for 1 hour a day. Let’s pretend I didn’t need that adapter (most people won’t) and that you use those lights for 3 hours/day. 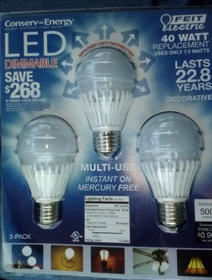 The four replacement bulbs would cost $30.44 without the adapters. 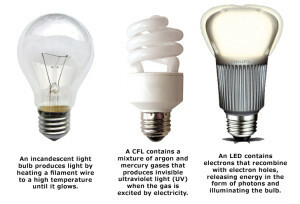 Your yearly energy cost would be $22.80 with the old bulbs (40 watt) and $2.70 for the new LED bulbs (4.8W). The savings is $20.10 and your breakeven point would be about 1.5 years. Now how many investments can you get your money back in 1.5 years and then save money for another 21.3 years?! That’s right , the LED bulbs also last way longer so you’ll be getting rewarded for many more years.